A little less than six years ago, Harold Sampson, then 74, was walking around the track at Marple-Newtown High in Newtown Square. Sampson, who will be honored June 4 at the Jewish Federation of Greater Philadelphia’s 2019 Circle of Partners event at Reform Congregation Keneseth Israel in Elkins Park, said he felt a tap on his head on what was a 90-plus-degree August day. “I looked around, and saw nobody else, so it must have been God talking to me,” said Sampson. “I’m a very spiritual person whose sole purpose in life is to utilize what Judaism teaches, so it had to be God and nobody else. Now 80, Sampson has since walked 10,537 miles. That includes a jaunt from his Broomall home to the Wells Fargo Center and a Sixers game on his 76th birthday in January 2015, an event covered by local media and ESPN. Sampson’s goal is to walk 11,562 miles, which is the round-trip distance between Broomall and Jerusalem, before, perhaps, slowing down. After all, he’s worked as a CPA for nearly 60 years. Sampson, however, is not being honored for walking, but as part of the Circle of Partners who have supported the Jewish Federation’s Jewish Community Fund, its predecessor campaigns or the campaigns of other Jewish Federations, for 25 years or more. Sampson will be recognized for his ongoing contributions to the Greater Philadelphia Jewish community, especially his synagogue, Congregation Beth El-Ner Tamid in Broomall. 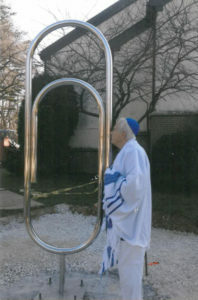 That is represented by the 7-foot, polished stainless steel sculpture of a paper clip, Sampson’s symbol of solidarity, tolerance and diversity on the synagogue’s front lawn. The project was financed by Sampson. “In Norway, the paper clip became a symbol of defiance against the Nazis in World War II. My wife [Charlotte] and I visited the park in Oslo where the memorial is,’” he said. The Sampsons also visited the Tennessee town of Whitwell, where a 1999 tolerance project became part of the curriculum. It involved students collecting 6 million paper clips to represent Jews killed in the Holocaust.